Gerani, Crete. 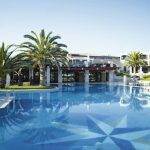 Find good value all inclusive holidays to Gerani. Just a stones throw from the more lively village of Platanias, but not as crowded and developed. Its still a small village with a wealth of hotels and restaurants to spend the night. There are buses that run frequently to the village of Gerani, or you could hire a car to get there as its only 17km from Chania. Its known locally as Kato Gerani or lower Gerani translated into English, the reason for this being there is another village of Gerani which sits above in the mountains, this is known as Pano Gerani or upper Gerani. 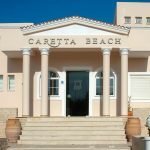 The beaches here have been awarded the “Blue Flag” beach award every year and continue to do so, mainly due to the constant care and attention given by the locals, and it looks set to be awarded it again. If your looking for a relaxing beach holiday then this resort is definitely for you, the beaches here are a mix of sand, shingle and pebble and the seas are warm and clear. You will find water sports and volleyball available on a daily basis and a beach bar or two catering for all your snack and drinking needs. Due to the size of the village the only nightlife you will find here is the chatter of people in cafes and Tavernas late on into the night. 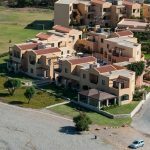 There are no clubs in the town but the resort of Platanias lies just 2 km away and is easily reachable by taxi. 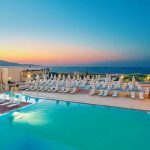 In this village you have the best of both worlds, you can relax on unspoilt and quiet beaches during the day, head off to Platanias during the night for the more lively clubs and pubs or just sit and talk to the locals in a quaint Tavernas and bars.